Alan Wayne Sheppard, “Wayne,” received his undergraduate degree from The Ohio State University in 1965. After teaching science for two years at Painesville Harvey High School he was admitted to The Ohio State University College of Law and received his JD in 1970. He has practiced law in Ohio since 1970 with a specialty in civil litigation. Wayne is a member of the Ohio, Columbus, and Delaware County Bar Associations, and is Past President of the Delaware County Bar Association. ​He serves on and has been chairman of the Columbus Bar Association Fee Arbitration Committee which handles fee disputes between clients and local attorneys. He was certified as a Civil Trial Advocate by the National Board of Trial Advocacy for ten years, from 1999 thru 2009. Wayne is rated as an AV lawyer by Martindale Hubbell. Wayne maintains his practice as “Of Counsel” with Loveland Law, LLC. 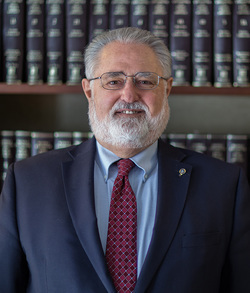 He has an active civil litigation and probate practice and serves as an arbitrator and mediator in both civil and domestic relations matters. He is an approved mediator for the Delaware County Common Pleas Court and has served as mediator in numerous foreclosure matters. He has completed the Basic Mediation Course conducted by Capital University Law School. Wayne is an active member of the Worthington-Linworth Kiwanis Club and longtime member of St. Stephen’s Episcopal Church. He also served for 10 years on the Buckeye Valley Local Board of Education. He has been married to Julia Sheppard for 50 years and has four adult children and eight grandchildren.